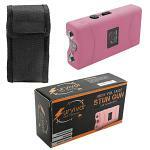 The Guard Dog Series Lipstick stun gun with flashlight allows you to shine the ultra bright flashlight and power the high voltage stun gun in a single-hand operation. Built to last through years of use it can withstand the daily abuse a flashlight must endure. Simply clip it to your keys or keep it in your purse so you have it anywhere, anytime. Small build, big bite the stun gun encompasses the volt trashing power of a stun gun while providing the daily practicality of a flashlight. Looking for more protection? You might also want a matching Pepper Spray! Overall dimensions: 4.63" x 1" x 1"
(L x W x H) 6.50" x 5.75" x 1.63"